A Passion for Play: Inexpensive craft kits are a no-brainer...literally! Inexpensive craft kits are a no-brainer...literally! I love craft kits for days when I 'm not feeling especially creative. 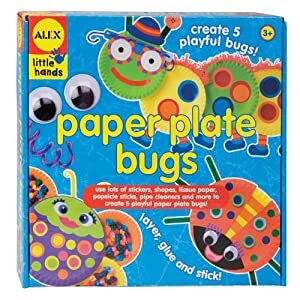 They are also great for when your little one wants to be crafty, but the idea of set-up and clean-up is just a bit too much that day. The Alex brand has some really lovely options that your kids will eat up. I like this one because there is no glue needed. 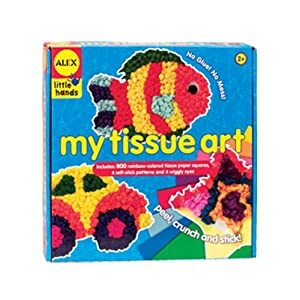 Just peel off one section at a time to reveal a sticky surface, crumple the tissue and stick! 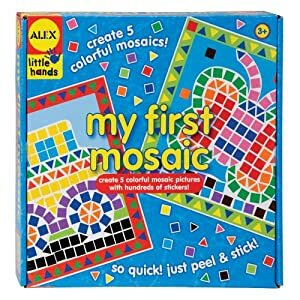 This mosaic set is incredibly easy for preschool age children and up. Just peel the shapes and stick them on! Here is a little guy I know making a T-Rex mosaic from this set.